Shirts With Random Triangles: Colorado Adds 3-Star QB Tyler Lytle To It's 2017 Recruiting Class. Colorado Adds 3-Star QB Tyler Lytle To It's 2017 Recruiting Class. Tyler Lytle. Image via pe-sports.com. Colorado has an eighth commitment to its 2017 recruiting class. Anaheim, California high school rising senior quarterback Tyler Lytle committed to the Buffaloes on Wednesday. 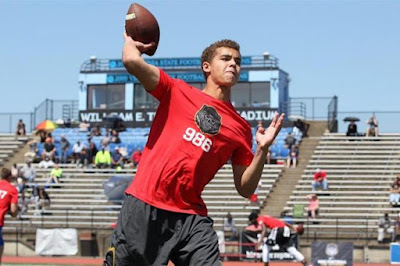 247Sports grades Lytle as a composite three-star pro-style quarterback. The recruiting site ranks Lytle at no. 29 among 2017 pro-style QB prospects, at no. 63 among 2017 prospects from the state of California, and at no. 628 in its composite national rankings of 2017 prospects. Lytle attends Servite High School in Anaheim, Ca. He stands 6'4.5, and weighs 199 lbs.